Here's the reminder I'll be sending to my local delivery customers for C11. My C11 order is due on Tuesday, May 10, by 8:00 p.m. If you are a Direct Delivery customer at my eStore, these suggestions may help you with your shopping. If you are considering a home based business, these are the type of bargains you can offer your own customers when you become a part of my team. Pg. 7-11, The Game Changers are only $19.99 each at intro prices. Choose Vitamin C Serum, AHA Refining Cream, or Extra Strength Retexturizing Peel. Or, you can buy one of each, because they will coordinate beautifully! Pg. 19, Gloss up your lips and glitter up your nails while Glazewear and Nailwear Pro+ Nail Enamel are any two for $5.99. Pg. 25, Prime & Pamper your nails with Nail Experts Instant Gel Cuticle Remover ($3.99), Gel Strength Base Coat ($3.49), and UV GLoss Guard Top Coat ($3.99). Pg. 27, I understand there are some women who never wear lipstick, but I'm pretty sure that most of the ones I know have more than one shade in their makeup collection. Avon has shades of Ultra Color Lipstick to fit your needs, whether you like your lipstick bold, satin finish, matte, or with a shimmer. Find your perfect shade (or two or three of them, while UCR is Lowest Price Ever of $5.99 each. Pg. 33, If you like a sharp point on your eyeliner but hate to sharpen it, Always on Point Eye Liner fixes that problem for you. Just twist the cap for a perfect point every time. Buy one for $8 and get one for .99. Pgs. 34/35, Mascaras are buy one, get one for .99. Sometimes one mascara does not do everything you want it to do, so try layering two to get the look you want, or use one for your top lashes and another for the bottom. Pg. 38, Ideal Flawless Pressed Powder for $6.99. Pg. 40, Be Blushed Cheek Color (LPE of $4.99), gives a quick, dewy, blush to your cheeks. Blend it with your finger tips and then swipe your finger tips across the top of your forehead for a barely sunkissed look. Pg. 49, Soft scents like jasmine, lilies, and citrus are great for summer and a 5-pc set of Haiku (pronounced high-Koo just like the Japanese poetry you learned about in high school) is only $19.99. There is a scent spot on the page. Pg. 55, If you prefer a fruitier scent, Secrets to Keep, StoK Kiss, and StoK Midnight are each $8.99. Pgs. 70/71, All Anew Eye Treatments are on sale at prices ranging from $16.99 for Vitale to $24.99 for Ultimate and Platinum. Pg. 146/147, Don't miss the pic of vintage products from the 1960s. Are you old enough to remember "Somewhere"? 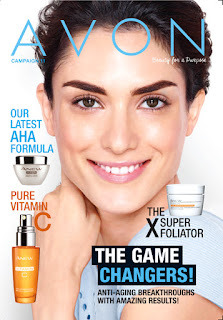 Our 130th Anniversary Special this campaign is Avon Senses Cherry Blossom. You get 2 Body Lotions, 1 Sparkling Shimmer Mist, 2 Hydrating Shower Gels, and 1 Shower Pouf - all for $10.99!! Pg. 174, Perfumed Liquid Deodorant is in the brochure and at LPE of $2.49. Back Cover, SSS Original Bath Oil Spray is $3.99. Everyone who uses SSS Oil needs a spray for after shower use and you can refill it from the larger bottle. Did you know you can read reviews for almost all of our products at my eStore? You might want to see what other customers are saying about products you are considering.